Workers at launch pad 39B at the Kennedy Space Center are stripping the facility of antiquated equipment to ready it for a new program, but NASA still doesn't know when another rocket could blast off from the storied complex or what the launcher will look like. NASA knows any next-generation rocket will not use the shuttle's custom-made fixed and rotating service structures, so those towers will come down this fall. The demolition will leave the pad with its raised concrete surface, sound suppression water tower and three 594-foot-tall lightning masts erected in 2009. "We were going to do this no matter what," said Jose Perez-Morales, the launch pad project manager. The agency's $1.3 million contract with LVI Environmental Services Inc., a New York-based demolition and remediation firm, calls for the iconic towers to be removed from the pad perimeter by Jan. 13, 2011, according to Perez-Morales. The January deadline is 200 days after NASA gave the contractor a notice to proceed with the demolition in late June. 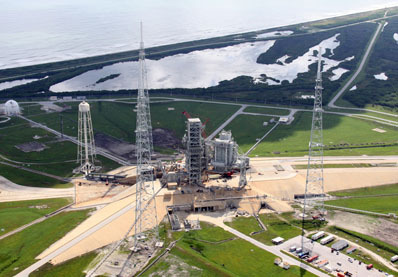 Pad 39B, the northernmost launch complex at Cape Canaveral, was expected to be the home of the Constellation program's Ares 1 rocket later this decade. But the Obama administration wants to cancel the troubled program in favor of commercial space transportation systems. NASA officials say the dismantling and refurbishment work at pad 39B is generic, and engineers are keeping all options open until Congress and the White House decide on a specific space exploration strategy. 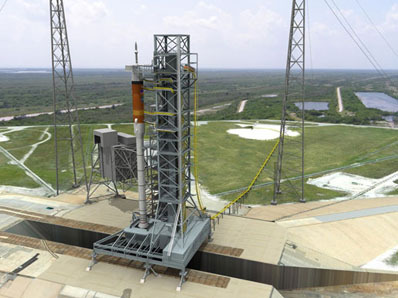 Perez-Morales said pad 39B could be outfitted for a heavy-lift rocket or a commercial launcher. "Any of the things we do here in terms of construction and renovations, we're trying not to preclude any of the vehicles that are on the table right now," Perez-Morales said. All the renovations at pad 39B are expected to be complete by late 2013 or 2014, then the complex will wait for a new tenant. "The vehicle that's going to fly from here (next) is still unknown," Perez-Morales said. "It could be heavy-lift or a commercial vehicle, and that opens the gamut." NASA expects to approve the contractor's demolition plan this week, giving workers the authority to start moving heavy equipment inside the pad. Unlike other launch complex demolitions at Cape Canaveral, pad 39B's servicing towers will not be imploded using explosives. Instead, NASA wants to methodically take apart the structures using cranes to protect the facility's concrete foundation, which the agency plans to reuse. The first step will be to cover the pad surface with up to 2 feet of sand, protective plates and ribbing. Workers will next move the pad's rotating service structure to a partially-retracted position parallel to the flame trench. The towers' removal will begin in earnest by the end of September, Perez-Morales said, with the removal of cladding and support metals from the rotating service structure, leaving just a skeleton before workers move in cranes to cut the 13-story gantry from the fixed tower, Perez-Morales said. Later this year, the contractor's attention will turn to the 25-story fixed service structure. Divided into 12 levels, the tower will be removed piece-by-piece as it was constructed. "They're going to go to each floor, disconnect each floor all around, and then take each floor down," Perez-Morales said. The contractor will move the remains of the structures to a parking lot outside the pad, where teams will cut the metal into smaller pieces for shipping to a recycling center. "The equipment will come in and do the final cutting and go to the parking lot, where they will sort the metals to decide what they're going recycle and what's going to the garbage can," Perez-Morales said. LVI Environmental Services will collect money from the recycling, reducing the cost of the demolition to NASA. "The reason why is because the contractor will get a lot of advantage because of the amount of steel, the copper, all the metals on the tower that he's going to recycle and get dollars for," Perez-Morales said. The fixed service structure was assembled from parts of the Apollo-era mobile launch towers used by the Saturn 5 rocket. NASA added the retractable rotating service structure specifically for the shuttle program. Launch pad 39B was first used by the Saturn 5 rocket on the Apollo 10 mission, a dress rehearsal for the first lunar landing. Saturn 1B rockets launched crews on missions to the Skylab space station in 1973. Three astronauts took off from the pad aboard another Saturn rocket in 1975 on a mission to dock with a Soviet Soyuz spacecraft during a detente in Cold War relations. The towers were used to prepare 53 space shuttle missions for flight between 1986 and 2006, beginning with the final launch of the shuttle Challenger. The Ares 1-X test flight also used the pad for its launch in October 2009. "I'm an engineer and my job is to build things," Perez-Morales said. "You feel a little bit funny when you're demolishing things because that's not your nature. As an engineer, you're trained to build and make sure things last forever. It's kind of mixed feelings that you're tearing down something that took so much effort to put together." Although the demolition of the launch pad's towers is the most visible work at the complex, other behind-the-scenes renovations include refurbishing electronics, cables and propellant tanks. Engineers identified 1.3 million feet, or approximately 246 miles, of cables at the pad that won't be needed again. Officials have removed about 845,000 feet of those cables since this spring. Equipment rooms beneath the pad surface has been cleared of Apollo and shuttle-era electronics to make room for new high-tech racks that will control the pad's electrical, propellant, pneumatic and communications systems. "The beauty of the pad and the work we're doing here is the electronics that we're installing, the new cables and all the things we're doing are very generic for any kind of vehicle," Perez-Morales said. "This is something we will have to do no matter what vehicle comes." The pad's spherical liquid oxygen and liquid hydrogen propellant tanks are also undergoing thorough repairs and should be ready again for duty by 2012, according to NASA. Engineers also took core samples of the pad's concrete surface and measured the strength of the crawlerway to see if they would withstand a heavy-lift rocket larger than the space shuttle. Perez-Morales said teams are still working on a pad design to accommodate the 390-foot-tall mobile launcher built for the Ares 1 rocket. NASA finished construction of the platform in January, but outfitting of the massive tower will continue over the next few years. Officials expect the mobile launcher will be ready for service by January 2014. "What the pad really does is provide services to the mobile launcher," Perez-Morales said. "If we're going to use the mobile launcher with the tower, that's where the vehicle-specific equipment is going to be." NASA is analyzing ways to modify the mobile launcher and pad to hold commercial or heavy-lift rockets, but the work can only go so far until a specific vehicle is selected. "Right now, since there are no decisions from Congress, all options are open," Perez-Morales said. "Based on where we are right now, we have to meet all the options." The fate of nearby pad 39A is even more unclear. The shuttle program will continue managing that facility until late 2011, giving pad 39B a two-year head start on its renovations. "We will not get Pad A until shuttle ends their flights," Perez-Morales said. "If at the end, Congress goes and adds another flight, that means we probably won't get Pad A until late next year. We're zeroing in on Pad B because they want to go and start doing some flying out of here maybe in 2013 or 2015." 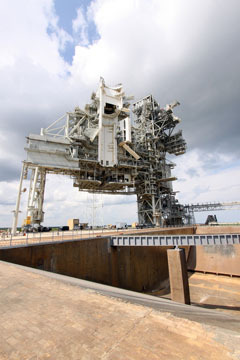 But pad 39B's next step will wait on word from Washington. "Next year will depend tremendously on what is approved," Perez-Morales said. "If we get heavy-lift approved, then we'll hopefully go to a heavy-lift budget."